When you are ready to purchase a photovoltaic (PV) solar electrical system, thoroughly check out the various packages that companies offer to ensure that you get the best solar electric panels. Be sure to explore tax incentives that are available. Between loan programs that solar power installation companies may offer and the tax credits and incentives available at both federal and state levels, you may be able to reduce the cost of a PV power system by many thousands of dollars. For example, photovoltaic solar panel systems that provide electricity for a home and that meet applicable fire and electrical code requirements are eligible for a federal tax credit of 30% of the cost up to $500 per .5 kW of power capacity. This program is for principal residences only (not rentals or second homes) and expires Dec. 31, 2016. In California, the Go Solar California program was launched in 2006 with a goal to install 1 million solar panels on homes in 10 years. This $3.3 billion program hopes to reduce the demand for energy during peak times while reducing the cost of electricity. How much juice does your home need? If your power bill breaks down the amount of electricity you use on a 24-hour basis, you can easily determine how many watts your PV array will have to generate in order to satisfy your home’s needs. During peak hours of the day, when the sun is highest in the sky and the PV cells can operate the most efficiently, output can range from 40 watts all the way up to 200 watts. The difference generally is in the technology, size, and price of the cells. Another way to gauge the cost of purchasing PV cells is to look at the dollars-per-watt cost ratio. A rough estimate would be to shop for modules that are priced in the $4- to $5-per-watt range. This means that if the module has a maximum output of 100 watts it would cost $400 to $500. 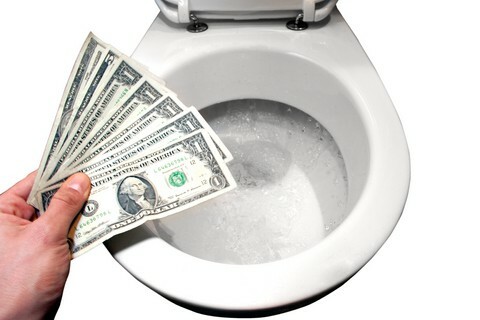 Using this method of calculation, you can roughly determine how much you would need to spend to power your home. Insolation is the term used to measure the amount of direct sunshine that falls on a square meter per day. It is rated in kilowatts and will help you determine how much energy you can expect your PV array to produce. Mounting on a stand may be more practical, especially if your home has a flat or unusual roof. Some module mounting stands come with sensors and motors to automatically turn and tilt the PV cells to follow the sun across the sky and capture the most energy possible. 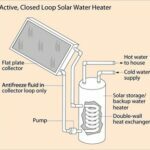 There are several kinds of solar collection technologies on the market today, but the primary one that catches homeowners’ attention is photovoltaic (PV). Most industrial or commercial solar energy power plants use reflective mirrors to focus the rays of the sun to super-heat fluids that in turn heat water to make steam for traditional steam-powered turbines. PV cells are different because they directly convert energy from the sun into electricity without needing a generator or any moving mechanical parts. Silicon, the second most common material on Earth, is abundantly found in sand. Manufactured silicon crystals are sliced to about 300 micrometers (a micrometer is 1/1,000,000 meter) thick and coated to work as a semiconductor to capture the sun’s energy. Solar radiation (sunshine) lands on a PV cell, and, as the energy is absorbed, electrons are freed and channeled off. The flow of electrons is basic electricity. Silicon PV cells remain the dominant style of PV cell on the market but require more materials and labor to produce than polycrystalline PV cells. Thin-film PV cells use either an alternative to silicon as a semiconductor or amorphous silicon. Thin-film PV cells have the advantage that the modules can be relatively flexible or bendable, mass produced, and engineered to directly cover building materials such as shingles and siding. 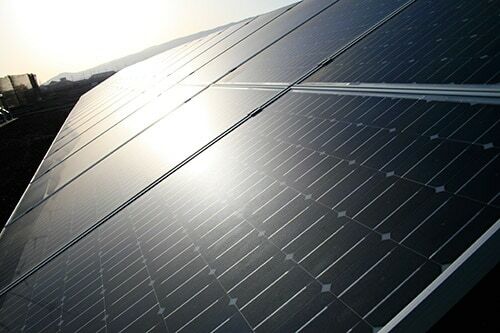 Though thin-film PV cells generate less electricity than the standard crystalline silicon cells, they can operate more efficiently in low light and cloudy conditions. Regardless of the type of PV cell, the amount of electrical output is measured in watts. Each PV cell may be as small as 3 inches square and generate only a few watts of electricity. 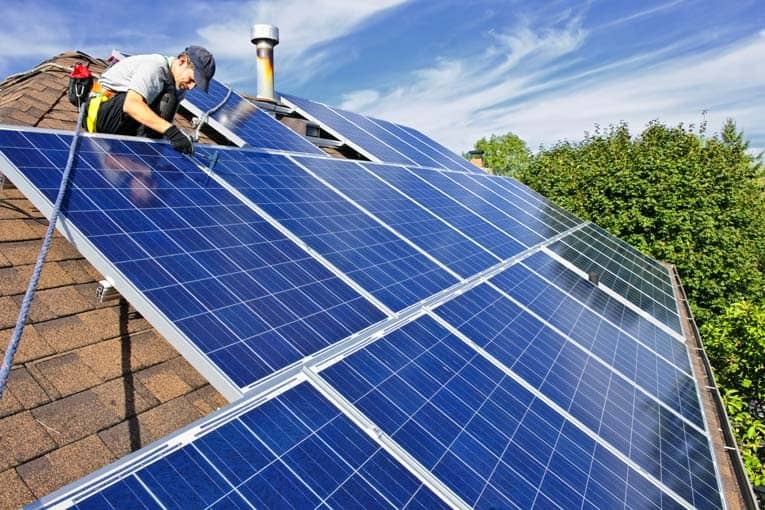 In order to gather a useful amount of power, cells are linked together to create modules that are the recognizable “solar panels.” A series of modules linked together is called an “array.” An array could have two or a thousand modules, depending on how much electricity is trying to be created. The PV cells create direct current (DC) electricity, which needs to be converted to alternating current (AC) for use within the home. Conversion occurs when the current is drawn through an inverter. Think of the inverter as the alternator in your car, which takes energy from the generator and converts it into usable electricity. Storing the electricity generated by a PV array is done by running the current into a bank of batteries. Except in the most extreme and remote areas, though, this approach is neither practical nor cost effective for the average homeowner. The size of the array required is often larger than the home can accommodate, so back-up generators are almost always required to maintain an even flow of electricity during dark winter months. If you are in the market for photovoltaic (PV) solar panels that can supply some or all of your home’s electrical power, you have no doubt discovered there are many different types of these panels and they are all quite expensive. As discussed above, panels differ in many features, including output, dollars per watt, efficiency, and mounting. The main manufacturers of these products each have their strengths and weaknesses—sorting through the various models can be challenging. One of the ways to measure the relative value of a solar panel is to figure its “dollars-per-watt” ratio. This figure will tell you how many watts per dollar of investment your solar panel will generate. For example, if a grid costs $800 and produces 170 watts, divide $800 by 170 to determine that its dollar-to-watt ratio is $4.70. Along with the dollars-per-watt ratio, the conversion efficiency ratio is a helpful measure of efficient output. The higher the conversion efficiency ratio, the better job the module does at converting solar radiation into electricity. Most modules on the market have a conversion efficiency ratio that ranges from 12% to 18%. Below we offer you a roundup of six major manufacturers of photovoltaic solar panels so you can take a much closer look at their products and make smart, informed choices for your home. If you are looking for name brand recognition in your solar modules, then you might consider Thomas Edison’s little enterprise, the General Electric Company (GE). Founded in 1892, GE has historically chartered a path to aggressively monopolize most emerging technology markets, and PV solar panels are no exception. In 2004 GE purchased AstroPower and became one of the first mega-corporations to officially jump into the solar panel mass production market. Though at the time it was simply thought of as a wise investment of an undervalued (and near bankrupt) company, in the past four years GE has grown their solar program considerably and in 2007 supplied 363 roof-mounted solar panels at the top of 45 Rockefeller Plaza in New York City to generate electricity for the first solar powered Rockefeller Center Christmas Tree. Available for residential applications, the GEPV 200 Solar Panel generates up to 200 watts at peak performance making it one of the most robust solar modules on the market. Weighing-in at thirty-nine pounds and measuring 39 inches by 58 inches, the GEPV 200 costs close to $1,100, though can often be found for less than this with volume discounts and when ordered online. Some of the selling points of the GE line of PV modules include easy installation with pre-drilled holes, a 25-year warrantee, and durable construction to resist rain, sleet, and hail. The GEPV 200 is rated for winds up to 125 miles per hour. For smaller applications GE offers a full range of PV modules including the 50 watt GEPV50 for around $352, and the GEPV100 for $589. Homeowners can purchase individual solar modules, or sign up for a package deal from GE directly. The GE Brilliance Solar Electric Power System is a complete energy generation system that includes a monitor to show you how much energy you are generating, consuming, and saving. Looking for heavy-weight output for less than $900? The Kyocera KC200GTcranks out 200 watts with a conversion efficiency of over 16% (high on a scale that typically measures from 12% to 18%). Another innovation from Kyocera is the The MyGen Grid-tie Photovoltaic (PV) Power System. This pre-packaged system contains everything the homeowner needs to install a PV system on their home, whether the house is being built new or is being re-roofed. Included in the “crate” are photovoltaic modules, a direct-current-to-alternating-current (DC-to-AC) power conversion device, DC wiring and protection, AC wiring and protection, lightning protection, as well as component mounting and mechanical support. If you are looking to go a step further and install a PV system directly onto your roof instead of within a rack-mounted system, Kyocera’s new MyGen Meridian is designed to be built directly into the roof of your home. Solar frames are installed with matching roofing tile, and when the roof is complete, the solar modules are snapped into the frames. This system makes for a seamless roof line and greater protection from high winds. British Petroleum, now marketing itself as “Beyond Petroleum” entered the solar energy market in the early 1970s and created BP Solar in 2000. Starting in Europe and Japan BP Solar became a profitable enterprise in 2004 and has introduced the BP Solar Home Solutions(R) in the limited markets, notably California and New Jersey. 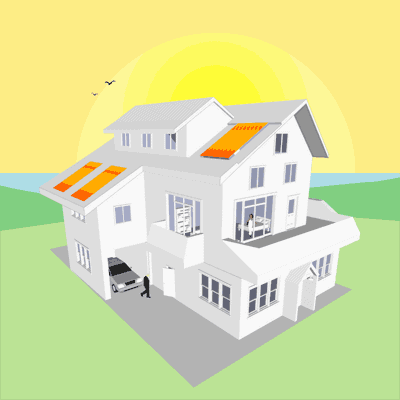 This program offered through Home Depot allows for buyers to select a full-service package for solar panel purchase, installation, and warrantee. For homeowners in other areas looking to invest in BP technologies, several modules are available for purchase. Starting at $759 the BP Solar SX-170B delivers 170 watts and is applicable for residential grid-tied systems as well as remote cabins, pumping and irrigations needs, and land-based navigation systems. The SX-170B (B stands for bronze frame) features installation-speeding quick-connectors. Asymmetrical RHW cables enable side-by-side or end-to-end module placement in arrays. Besides the traditional solar cell/module/array product, BP Solar is also working to introduce the BP Solar Energy Tile to domestic markets. These tiles offer similar energy generating capacity but are small–the size of an asphalt shingle. BP is working with Old Country Roofing in California to offer this style of solar roofs to prospective home buyers. Many people are familiar with the Sharp television brand, but few may realize that this company is almost 100 years old. Sharp invented the mechanical pencil in 1915, and since has grown to be one of the major international technology providers. Starting in the mid-1950s Sharp began work on solar panels, even designing the first solar arrays for the aerospace industry. In the early 1980s Sharp again capitalized on the solar power market by distributing a wide variety of solar powered watches and calculators. In 2000 Sharp became the world-wide production leader in solar cells, a place they still hold today, and in 2003 launched a program to bring solar power to American homes. Sharp has a wide range of products available in the solar module market and several Sharp solar panels specifically designed for use in grid-tied residential settings. The NE165U1 165-watt solar module connects 72 individual cells in series and weighs less than 38 pounds. A taller and narrow module topping 61 inches yet only 32 inches wide, the Sharp NE165U1 retails for about $870. A recent improvement to the Sharp product called the OnEnergy Solar System includes an integrated grounding system to make installation easier and faster for residential uses. The system streamlines installation by requiring fewer roof mounted racks to secure the modules, simplified hardware that only uses two kinds of mounting lugs (meaning fewer tools to haul to the roof), and a set-up that requires less copper wire. At the 2008 summer Olympic games in Beijing, upstart solar manufacturer Suntech won the contract to be the sole solar power supplier for the famous Bird Nest Stadium. Suntech, a dark horse in the residential PV solar market is making strong inroads to the American market by providing economically priced Suntech solar panel modules. For the Suntech 180-watt STP180-24/Ab-1 retailing at $849, the dollars-to-watt ratio is $4.71. Tall and narrow like the Sharp design, the Suntech 170 watt module weighs only 34 pounds. Though historically in the commercial market, Suntech has developed several monocrystalline and polycrystalline modules for the residential market that have design characteristics allowing them to perform above average in low-light situations and a mounting scheme that creates a uniform pattern for a more attractive roof. The Spruce Line photovoltaic solar panels by Evergreen are some of the most progressive modules on the market today. Using a proprietary “String Ribbon” technology, the Spruce Line is able to outperform thin films and achieves comparable performance to bulk crystalline technologies while using less material in production. Evergreen Solar developed the String Ribbon technology to reduce the overall use of silicon in the manufacturing process. Unlike traditional silicon wafers that are grown and then sliced, Evergreen produces their wafers in a furnace. With no slicing involved they are able to instantly save on raw material cost and reduce waste. When compared to traditional methods of creating the silicon ingot then slicing the wafers, the String Ribbon technology uses one-third the amount of silicon in the production process. With an ever increasing demand for silicon by PV manufacturers, some experts have warned that supply for this material won’t keep pace with demand. By developing the String Ribbon process Evergreen has helped off-set any future shortages in their production cycle which should mean they will be around for some time. Because onsite power generation technology like PV modules is still a relatively risky enterprise, business stability is a concern for homeowners, especially where warrantees are concerned. Besides using fewer resources and generating a smaller carbon footprint in production, String Ribbon technology allows Evergreen to build more versatile shaped wafer which allows for a higher wattage generation to size ratio. The Spruce Line offers modules with outputs ranging from 170 to 195 watts starting at $789 for the lower wattage model and run up to $939 for the 195 watt model. Modules weigh about 40 pounds each and measure about 38 inches by 62 inches and are manufactured in the United States.